Vania Zaporozhets worked for Genrikh Yagoda, the head of the Peoples Commissariat for Internal Affairs (NKVD). It It has been claimed by Alexander Orlov, an agent of NKVD, that Joseph Stalin had asked Yagoda to arrange the assassination of Sergy Kirov. Yagoda assigned the task to Vania Zaporozhets, one of his trusted lieutenants in the NKVD. He selected Leonid Nikolayev, as a possible candidate. Zaporozhets met Nikolayev and when he discovered he was of low intelligence and appeared to be a person who could be easily manipulated, he decided that he was the ideal candidate as assassin. Zaporozhets provided him with a pistol and gave him instructions to kill Kirov in the Smolny Institute in Leningrad. However, soon after entering the building he was arrested. Zaporozhets had to use his influence to get him released. On 1st December, 1934, Nikolayev, got past the guards and was able to shoot Kirov dead. Nikolayev was immediately arrested and after being tortured by Genrikh Yagoda he signed a statement saying that Gregory Zinoviev and Lev Kamenev had been the leaders of the conspiracy to assassinate Kirov. Leonid Nikolayev was executed on 29th December, 1934. Over the next couple of years all those involved in this conspiracy were murdered. Zaporozhets was sent to the gulag and it is believed he died in 1937. 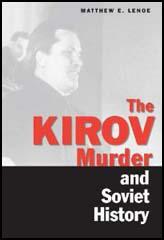 Kirov's assassination was obviously not the work of Nikolaev alone. Peter Chagin, a prominent Party official and close comrade of Kirov, has told the author that several attempts were made on Kirov's life in 1934. It was a real manhunt, directed by a strong hand. For example, there was an attempt during Kirov's trip to Kazakhstan in the summer of 1934. As for Nikolaev, at first he acted on his own initiative. Psychologically unbalanced, he imagined himself a new Zheliabov, and planned the murder of Kirov as an important political act. (The story that Nikolaev acted from envy was spread around later on, apparently to compromise Kirov or for some other reason.) Kirov liked to walk around Leningrad, and Nikolaev carefully studied the route of these walks. Of course Kirov was carefully guarded; his guards, headed by the NKVD official Borisov, walked before and after him in civilian clothes. Once the guard's suspicions were aroused by a passerby who tried to get too close. He was detained. This was Nikolaev. His briefcase had a slit in the back, through which a revolver could be taken without opening the briefcase. And a revolver was there, loaded, along with a map of Kirov's route. Nikolaev was at once sent to Leningrad NKVD headquarters, where he was questioned by Deputy Director Zaporozhets. (It was subsequently explained that Zaporozhets and other officials of the Leningrad NKVD were active participants in the plot. But the director, F. D. Medved, apparently did not take part in the planning of Kirov's assassination.) After questioning Nikolaev, Zaporozhets phoned Moscow and reported everything to Yagoda, then Commissar of Internal Affairs and one of the people Stalin most trusted. A few hours later, Yagoda instructed Zaporozhets to let Nikolaev go. With whom had Yagoda consulted in the meantime? During the trial of the so-called "Right-Trotskyite bloc" in 1938, the defendant Yagoda confirmed the facts given above, but claimed that he got his instructions in 1934 from Avel Enukidze and Rykov. Nowadays this story is not believed by anyone: Yagoda had far more influential patrons. When Nikolaev was released, he acted in a very clumsy way, and a few days later, on a bridge, he was again arrested by Kirov's guard. For a second time the same loaded revolver was taken from him. The strange liberalism of the Leningrad NKVD officials, who again let Nikolaev go, aroused serious suspicions among Kirov's guards. Some tried to protest, but they were told at the NKVD that it wasn't their business. Individual guards had their Party cards temporarily taken away and were threatened with expulsion. All this was so suspicious that Borisov decided to tell Kirov that someone was after him and that the armed terrorist Nikolaev, who had been arrested twice by the bodyguards, had once more been released. We do not know what steps Kirov took after the conversation with Borisov. In any case, the conspirators quickly learned of Kirov's conversation with Borisov, and that soon decided Borisov's fate. In spite of all this, it was Nikolaev who killed Kirov in Smolny on December 1.